The Drools team should be proud! CISCO (as any hardware vendor) needs serious reliability proofs before choosing a rule engine! 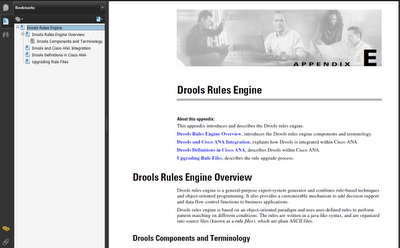 JBoss Rules is the supported and branded release of the Drools project. Drools is an enhanced Rules Engine implementation, ReteOO, based on Charles Forgy's Rete algorithm tailored for the Java language. Drools provides for Declarative Programming and is flexible enough to match the semantics of your problem domain with Domain Specific Languages. A Standards-based business rules engine that enables easy business policy access, change, and management.